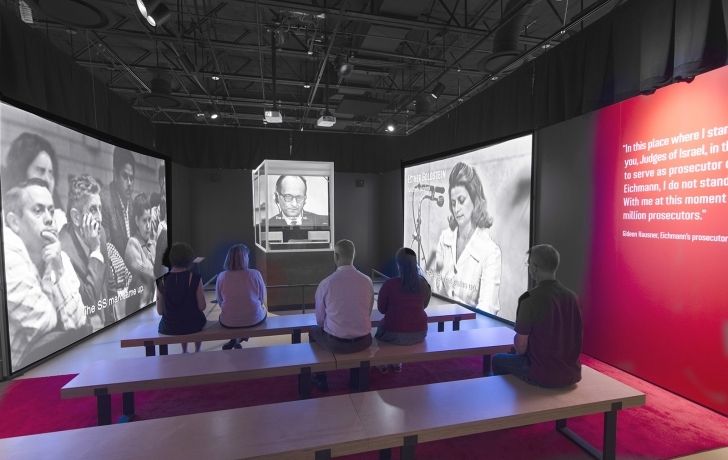 Visitors watch a recreation of the trial with Eichmann, projected into the original bullet-proof glass booth where he sat, along with archival film footage of witnesses. Photo: Government Press Office. All photos courtesy of Maltz Museum of Jewish Heritage. Fifteen years after the end of World War II, Adolf Eichmann, the man who engineered the deportation of six million Jews to death camps, was seized by Israeli intelligence operatives in Argentina. The dramatic details of that story are told in the newly opened exhibit, "Operation Finale: The Capture & Trial of Adolf Eichmann," at the Museum of Jewish Heritage. More than a true cloak-and-dagger tale, with all the concomitant elements—missed opportunities, coincidences, forged documents, code names, safe houses—the show is also thought-provoking and moving. Bravo to its curators and designers. The story is told through seemingly mundane objects that here hold a formidable fascination. The tools of the forger that doctored passports, the fake weathered license plate, a counterfeit vaccination certificate all reveal the painstaking care that went into this top-secret operation. One false move could not only expose them to arrest by the Argentinian police but would allow Eichmann to once again slip away. In 1950, monasteries and convents provided Eichmann with shelter as he made his way to Italy where he received a Red Cross humanitarian passport using the alias Ricardo Klement. From Genoa, he sailed to Argentina, one of several South American countries that welcomed former Nazis. His wife and children would join him two years later. It was an emigré and concentration camp survivor, Lothar Hermann, also living in Buenos Aires, who first became suspicious of Klement. In 1956, Hermann's daughter, Sylvia, was being wooed by a Nick Eichmann and Hermann believed that the suitor was Adolf Eichmann's oldest son. Hermann shared his thoughts with a friend, Dr. Fritz Bauer, a Holocaust survivor who had became a chief prosecutor in Germany. Bauer passed the information to the Mossad, the Israeli intelligence agency, and two agents were sent to Buenos Aires. After seeing the dilapidated house where Eichmann presumably lived, they decided that no former high-ranking Nazi officer would live in such a hovel. But in 1959, with more evidence, Fritz Bauer convinced the Mossad that Klement was indeed Adolf Eichmann. Agents were again sent to Buenos Aires, this time prepared to bring him back to Israel. Before leaving on their mission, Bauer allowed a Mossad agent to secretly photograph Eichmann's SS file. The file would prove to be very useful. Soon after the agents, who posed as tourists, arrived in Buenos Aires, one of them surreptitiously took a photograph of Klement. (The camera he used along with the guidebook the agents bought to complete their disguise are on display.) Another agent, a forensic science expert, compared the size and shape of Klement's ear in the photo with that of Eichmann's photo in his SS file. The likeness confirmed Klement's true identity. Using different rented cars, the agents shadowed Klement, meeting in coffee houses around the city to discuss the abduction plan. The capture, and the moments leading up to it, are well told in a dramatically reenacted video narrated by one of the Mossad operatives. Eichmann was taken to a “safe house” where the agents were forced to wait an extra nine days because of a delay in their El Al flight. In order to sneak him onto the plane, Eichmann was dressed in a steward's uniform. Drugged and holding a fake passport, he was passed off as being ill. In case the escape by air had proven impossible, Plan B was to load the prisoner onto an Israeli cargo carrier docked in the city's port. In preparation, a secret compartment had been built in the captain's quarter. The core of the museum's exhibit—the story of the capture—was created for a show at the Mossad headquarters in Israel to commemorate the 60th anniversary of Eichmann's apprehension. It has been considerably expanded for its debut in the United States. "It was not ready for an American audience," said consulting curator Yitzchak Mais. "We needed to create the context. Who was Eichmann? What did he do? Why was he in Argentina?" One of the most important additions was the last room, containing only the glass booth where Eichmann had stood, stony-faced, as he listened to the testimony of more than 100 witnesses. Recorded portions of their harrowing and heart-breaking stories fill the room. Archival film footage of survivors is projected on the wall as they recount the atrocities. "It was the first televised trial and it was broadcast around the world," Mais said. "It entered our living rooms and we were suddenly confronted with details from people who had a face. It was the first time the events of the Holocaust were publicized, and it was experienced by a public that was unknowing of what had happened." Before and during the trial, Eichmann expressed no remorse for what he had done. "To sum it all up I must say that I regret nothing," he said in a 1960 Life magazine interview. Eichmann was hanged on May 31, 1962, and his ashes scattered at sea. "Operation Finale: The Capture & Trial of Adolf Eichmann" is on view at the Museum of Jewish Heritage, 36 Battery Pl., through Dec. 22. More information and tickets here.